Located in Ban Krue Se, 7km from Pattani on the road to Narathiwat, To Khieng’s famous half built mosque has stood up well to the last four centuries and, more recently to attacks by the Thai armed forces. On the evening of 27 April 2004, a group of Thai muslims came to the mosque to pray and subsequently attacked two security checkpoints nearby. After the attacks they fled back to the mosque where a siege unfolded between them and the Thai military. The siege continued till the early afternoon of the following day, by which time there had been heavy gunfire and deaths on both sides along with innocent bystanders. In the end after a very long-running attempt to coax the militants out to surrender, the Thai military sent in Special Forces troops with orders to shoot to kill -- they killed 31 militants aged between 17 and 63. The deaths and particularly the attack on a highly revered mosque provoked an outcry amongst Thai muslims who claimed that the militants were not given sufficient time to surrender. Simultaneously the actions of the militants caused much support for the Thai forces amongst the general Thai public. Today, the mosque has been repaired, though the new concrete patched around the mosque’s walls bear evidence to the damage inflicted upon it. Next door to the mosque is the grave of To Khieng’s poor sister, set in a small very kitsch Chinese garden with a sitting area, well looked after and another popular destination for Chinese and Malaysian tourists. There are plenty of stalls selling dried fish and giant squid which, to the Malaysian and Singaporean tourists seem like the equivalent of postcards to westerners. (If you do want a giant, dried souvenir squid then prices are slightly lower here than at the San Jao Leng Ju Khieng Shrine in town). 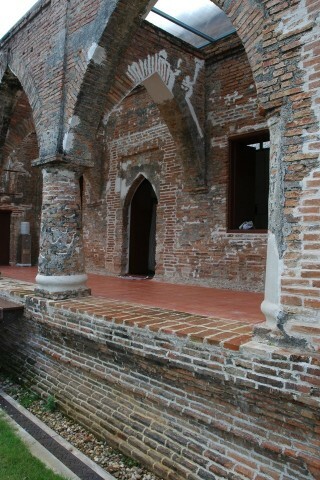 To reach the mosque, songtheaws cost 10B and motorbikes 50B from Pattani. You cannot miss the mosque as it is right by the side of the main road on the left hand side.